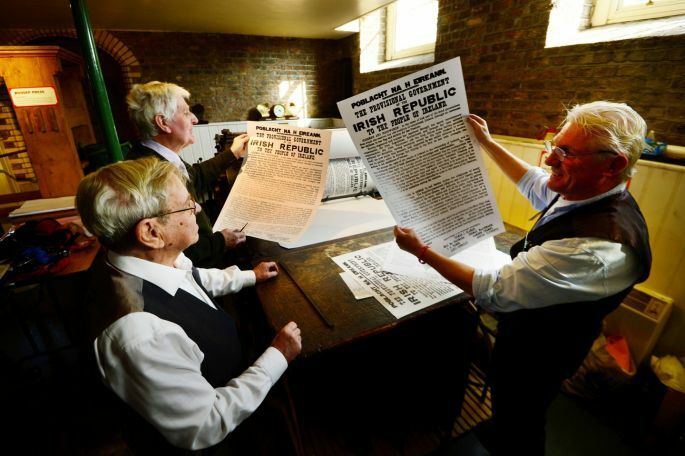 As I wrote above, the printing of the Proclamation of the Irish Republic was a central part of the events of the 1916 Easter Rising in Dublin, and it was commemorated in several different ways during the recent centenary. One of the most authentic experiences was to see a full size replica being printed at the National Print Museum in Beggars Bush Barracks, on a Wharfedale stop cylinder press, similar to the one which was used for the actual printing 100 years ago. The Museum has a copy of the Proclamation on display, and it was this which was used to make a photo polymer letterpress block. The machine itself, which was once used by the Nenagh Guardian, ran noisily but beautifully, expertly handled by a crew of three veterans, Alf McCormack, Freddie Snowe and William Ryan. This was accompanied by much authentic joshing between the trio as to who had been a compositor and who a printer in their working lives. The Proclamation is intriguing from a printing perspective. It was type-set and printed in secrecy on a Wharfedale Press in Liberty Hall. As sometimes happened in small printing offices in Dublin, its printers were short of type. Once they had begun their work, it became clear that they would not have enough to set the entire document. The resourceful compositors, Michael Molloy and Liam O’Brien, and printer Christopher Brady, decided to print the document in two halves. Once the top half was finished, they reused their type and set the text for the bottom half. 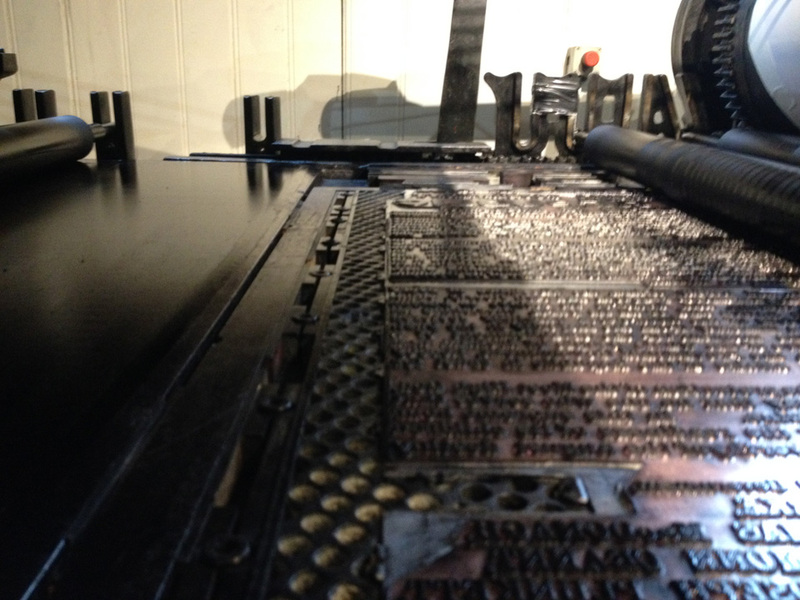 They then locked up this forme and returned it to the bed of the machine. Next, they reinserted the half-printed sheets into the press. A clue to their technique can be seen in some copies of the Proclamation, as one half is more heavily inked than the other. With the original metal type long gone, the only way of printing it by letterpress is to create a polymer block from a photographic copy, and this can be seen in my photograph below. The chase holding the plate can be clearly seen, with the block locked in place with traditional quoins. A limited edition of 100 copies, produced on a heavyweight paper, was printed on the day. This is still on sale from the Museum shop at €200. However, a more modestly priced unlimited version is also available, printed from the same block on the same Wharfedale press. At just €20, it makes a great present.